The Waikato River has its source on the flanks of this peak, which presents quite different characteristics when viewed from its different aspects. From Whakapapa it is a huge bulk, a formless mass rather than a peak. From the north-east, on the Desert Road, it is the most distinctive of Ruapehu’s summits, an elegant cone. Seen from Tukino, Te Heu Heu is a grand peak, capped by intimidating rows of bluffs. These leaning bluffs are still more impressive when looking up at the peak’s short, steep southern faces from the Summit Plateau. A long, stately ridge that is seldom climbed. 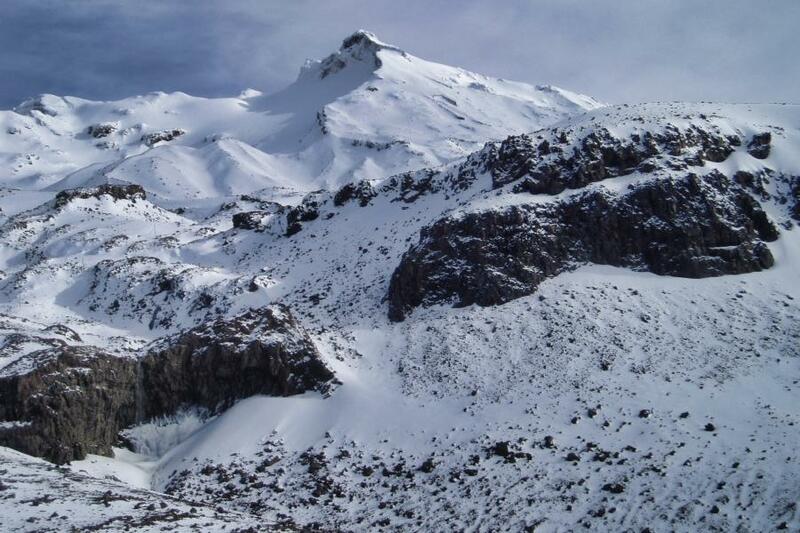 All the same, its elegance and the fact that it was the route of the first recorded ascent of any of Ruapehu’s peaks give it some claim to classic status. The old Waihohonu Hut, 45 minutes off the Desert Road, was once the regular setting off point for climbs of the mountain, and remains the best point to set out from on this route. The ridge itself is not difficult, but makes for a long day. Descend the same way. From the top of the Te Heu Heu valley T-bar at Whakapapa skifield, gain the upper end of Pinnacle Ridge where it merges into the bulk of the upper mountain. Climb towards the saddle between Te Heu Heu and Tukino and then along the crater rim to the summit. The South Face is an aesthetic slab of snow or ice rising from the col at the northeastern end of the summit plateau, and perhaps the best route on the peak. About four pitches, mostly around 50 degrees but up to 65 degrees. Conditions will vary; typically hard snow in late winter and summer, by late autumn iron-hard ice may be encountered. The left side of the face has a rather better run-out – the right edge, however, is a more atmospheric place to be. Gain access to the full East Ridge from the head of Tukino skiﬁeld by climbing into and across the huge basin below the Mangatoetoenui Glacier. The lower ridge is straightforward, made more interesting by the steep bluffs that fall below to the Mangatoetoenui Glacier. The ridge gradually narrows and steepens: the ﬁnal step below the summit, although short, will likely require a rope. In winter the rocks may be heavily rimed. The ﬁnal step can also be reached from the north-east corner of the Summit Plateau, by traversing across the South East Face between the two bands of cliffs.